Charl Langeveldt is a South African pace bowler who has played in all the three formats - Test, ODIs and T20Is for South Africa. A right-arm fast medium bowler and relies on swing rather than pace. When Langeveldt started playing First Class cricket for Boland alongwith his job as a Prison Warder at Darkenstein Prison in 1997/98 season. He soon developed himself into a genuine swing bowler. 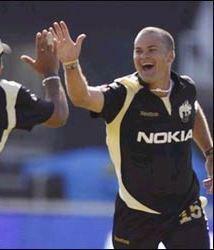 This led to his inclusion in the South African ODI Team in 2001. He played his first ODI against Kenya taking two wickets. In his second match against the same opposition, he had an excellent bowling figures of 4/21. He then was the part of the 2003 World Cup team but played only one match. In 2005, he took a hat-trick against West Indies in the last over of the match. 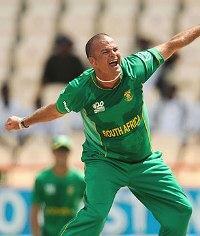 By this hat-trick he become the first South African cricketer to took a hat-trck in ODI cricket. Langeveldt made his Test debut against England at Cape Town in 2005. He took a five-wicket haul in his first test. But he fails to perform the same way in rest of his Test career, which leds to a very short Test career for him. Now he is in late 30s, so the chances of his return to the South African Test side are very rare. Langeveldt also played in IPL (Indian Premiere League) for Kolkata Knight Riders (in 2009 and 2010) and Royal Challengers Bangalore (in 2011). Inspite of playing in very few matches he did extremely well in those matches. He took 13 wickets in just 7 matches with an average of 14.38.